We will show that lactate measurement is vital for soccer training because soccer is primarily an aerobic sport. This is in direct contrast to the prevailing opinion among many coaches that soccer games and training are mainly non oxidative efforts. We will also demonstrate that there is a specific speed range (of moderate jogging) which we call the Critical Zone. Aerobically trained athletes recover at this speed while lesser trained athletes get tired at this pace. Lactate testing will tell you which. The difference often changes the outcomes of games. Throughout the past decade many researchers have developed a reliable literature on the metabolism of lactate (lactic acid, LA) (4, 5, 6, 7, 13, 14, 15). Lactate is generated within the cell as a product of glucose metabolism, especially in muscle cells, during exercise. Several of the documents cited have not only shed light on the dynamics of lactate at rest or during recovery, but have solved many of the questions on the role of lactate metabolism during the athletic effort itself. These studies have looked at various training conditions with respect to volume, intensity, length of rest periods, and number of workloads. But perhaps the most important results from the study of lactate metabolism have been the understanding of the physiology and the energetic cost of competitive performances both in cyclical sports (such as track and field, swimming, cycling or rowing) and non cyclical intermittent sports in which aerobic oxidative and non oxidative efforts alternate (such as soccer, basketball, football, field hockey, ice hockey, rugby, tennis, etc.). This article will focus primarily on soccer. This research has led to some biological principles that have allowed us to optimize the testing methodologies that measure blood lactate levels, and are now widely used to monitor sports training and competitions. For example, Dr. Lothar Kipke began his presentation at the 1989 London meeting of the International Federation of Swimming by saying, “Researching and controlling lactate levels in the blood, during and after an effort, is one of the most important tools for diagnosis and prognosis on the effect of training and competition” (16). Before describing the methodologies used to evaluate lactate levels in soccer, I believe it would be useful to discuss briefly some aspects of lactate metabolism to provide the scientific basis for the methodologies described in this article. Then, we will show how to interpret the results and convert these interpretations into specific recommendations for trainers and coaches. Lactate, as an intermediary in glucose metabolism, has persistently been condemned as a pernicious substance that generates fatigue, muscle soreness, distress and even pain. For years it was portrayed as “the bad guy”, due to mistaken interpretations by research workers. These mistaken interpretations were then applied using inappropriate training methodologies that did not facilitate lactate metabolism, produced during exercise. We believe that this misunderstanding of these phenomena has resulted in an ability that has limited trainers and physicians in the development of correct training and monitoring methodologies. For example, early in the 20th century there was the erroneous belief that lactate production was necessary for muscular contractions. This concept was refuted when it was proven that muscular contractions can occur when lactate production rates were low. Another error was the belief that lactate was generated only in the relative absence of oxygen in the mitochondria. Today, it has been unequivocally demonstrated that lactate production may take place in the presence or absence of oxygen (6, 9, 15). The output of the glycolytic system is pyruvate, and pyruvate has two fates. It either enters the Krebs Cycle and is oxidized, or it is converted into lactate. The lactate can enter an adjacent cell, or enter the blood stream and end up in another muscle cell, the heart or some other organ in the body and then turn back into pyruvate. This movement of the lactate around the body is called the Lactate Shuttle (4). A great deal of research on lactate with special carbon tracers (4, 5, 13, 15) has proven that lactate metabolism occurs throughout exercise, taking place at all degrees of intensity including rest and recovery from exercise. During resting and moderate exercise, lactate is produced and removed simultaneously. The lactate is produced in the muscles and then removed by various processes. The most common process is to be converted back into pyruvate (primarily in the same muscle), and then oxidized after it has moved somewhere else in the body. When lactate is being removed as fast as it is produced, there is what is known as a lactate steady state. During a steady state the appearance (Ra) and disappearance (Rd) of lactate is at the same rate; and this rate (in terms of time) is called the Lactate Turnover Rate (Rt). Most of the removed lactate is being oxidized in the Krebs Cycle, after it turns back into pyruvate someplace in the body. The fact that 60-70% of lactate produced during activity is removed and subsequently oxidized in the Krebs Cycle (Rox), today allows us to define lactate as predominantly an oxidative fuel. Because lactate reconverts rapidly to pyruvate and is then oxidized, its production and removal are mostly balanced and its concentration in biological liquids does not change much. This is true within the muscle cells, and also in the bloodstream, where lactate "released" by the cells is then removed by other tissues. Both types of metabolic events (appearance and disappearance of lactate) are seen during a sport such as soccer, where intensities vary intermittently during the game. During a game, high intensity effort produces lactate faster than it can be removed and then as the intensity lessens the removal rate is higher than the production rate and lactate levels fall. The average values during a game are 4-6 mmol/l (see Table 1), with ranges of 1.5 to 8-9 mmol/l. These values reflect 1) differences in intensities during various parts of the game and 2) differences in conditioning levels of the individual athletes as the necessities of the 90 minute game require the athletes to shift from slow to fast to slow again. 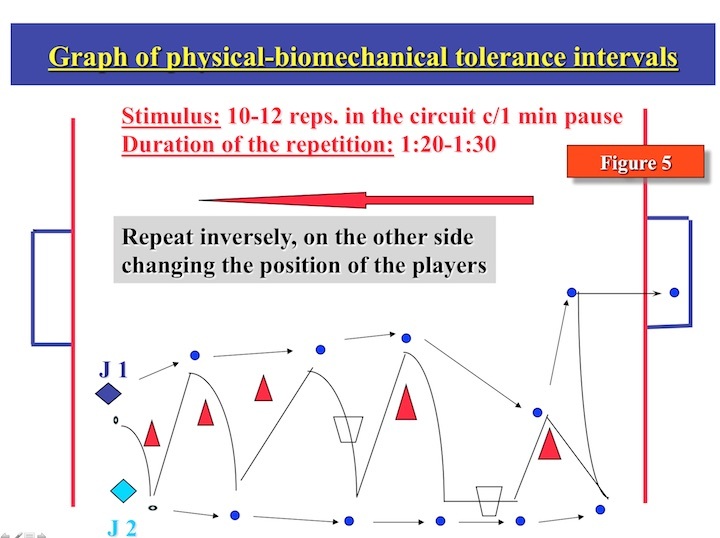 Because of the shifting intensities, the players must be trained to handle the varying intensities of the game and monitored over time to see if the training is working. It is highly desirable to train the athlete’s ability to remove lactate quickly so that it does not build up in the body during a game. Research on exercise intensity (7, 13) and our own investigations (18) show that during training, constant efforts lasting between 50 min and 80 min can be sustained in which lactate levels oscillate between 2 and 4 mmol/l. The lactate values can fluctuate within this range and even drop slightly during a prolonged effort, at a sustained velocity. Also in training, interval intensities greater than the levels from the previous paragraph can be sustained for 25 min to 40 min and produce higher lactate levels (values of 4 to 7 mmol/l). During these efforts there are higher rates of both lactate production-and removal. Given that Donovan and Brooks (7) have demonstrated that “lactate turnover” is “concentration-dependent” (between 1-3 mmol/l, tending to a plateau between 4-7 mmol/l), it is important to monitor conditioning levels and develop workout strategies (intensity, duration etc.) that improve these recovery capacities in the soccer player during training, so that they will later function adequately during a game, when intermittent competitive efforts are frequent and quick recovery is essential. Over the past 30 years sports and exercise science has made invaluable contributions to the understanding of the most important physiological and metabolic effects of training and competition in non-cyclical sports such as soccer. These research studies have allowed us to estimate scientifically the energy spent in this type of athletic discipline, and the correlation of athletic conditioning levels with fatigue, during and after a game. This helps in the construction of practical training plans. The primary conclusion is that it is important to reject the outdated concept that soccer is a predominantly “anaerobic” or non oxidative sport. E. Fox (11) categorized soccer (along with basketball, rugby, tennis and field hockey, among others) as 70-80 % “anaerobic” or non oxidative and 20-30% aerobic. Modern scientific evidence firmly contradicts this assertion, showing energetic costs that are exactly opposite. In fact, soccer is mainly aerobic, with a few “anaerobic” or non oxidative demands during a game. Reversing this false concept has important methodological consequences because many trainers and coaches still believe that the concept of VO2 max is not important in this sport. The game itself changed radically over a 30-40 year period. Studies done in the 1960s that measured the distances covered on a soccer field during 90 minutes of playing time show an average distance of 4,500 to 6,000.meters were covered in a typical game. In the 1980s, studies cited by Reilly (20) show a much greater total distance covered, up to 9,000 to 10,000 meters. (1, 3, 8, 21, 23, 26, 28). Moreover, actually, all the match analysis reports known in the world, determine average distances of 10.000-12.000 meters, by match. This has produced important changes in the player-distance covered relationship, dynamic movements, and distribution of ball possession times compared to running distances and movements without the ball. During the past 30-40 years, 20 field players increased the distances covered an average of 3,000-4,000 meters during 90 minutes of playing time. This represents increased distances of 60 to 80 km on the same 105 x 70 meter playing surface with a single ball in play. The average speed during a game has essentially doubled. Consequently, the free spaces on the field have literally disappeared, and the reception and decision times with the ball have been dramatically reduced. Reilly et al (10) broke down the distances covered during a game at different running velocities using the fractional velocity ranges of Van Gool et al. (26). The various speed ranges that a soccer player uses during a game were fit into 4 different velocities. These are walk, jog, stride (or cruise) and sprint. Lateral (sideways) and backward running can also be distributed within these four speed ranges. We have added, "moderate jogging" as a category and called it the Critical Zone because it is a special speed range. The two slower velocities produce recovery in nearly all athletes. The two faster speeds universally lead to fatigue. But the Critical Zone leads to either recovery or fatigue depending upon the conditional level of the player. On average, 19% of the whole distance in a game is covered at this speed. A key objective of training must be to take a player who fatigues at a moderate jogging pace and improve their conditioning so they recover at this speed (3.5 to almost 5 m/sec). These five velocities happen in no particular order during a game, leading to the conclusion that this type of sport is what we term non-cyclical and intermittent. This type of sport deserves special considerations, different from the typical testing done with sports based only on racing. During explosive efforts of up to 10 seconds duration, both non oxidative systems (ATP-PC and Glycolitic system) are very active but each Phosphocreatine (PC) and Glycolysis, contribute, in different proportions to the rapid requirement for energy. As a result of these high intensity actions, the depletion of ATP reserves and Phosphocreatine (PC) happens very quickly. In addition moderate amounts of intramuscular lactate build up. This then requires the need to re-synthesize the PC and remove the lactate simultaneously, which can only take place during the periods of light activity or rest (Velocity levels I and II above and for those well trained - Velocity level III ). Intermittent rest periods, in games such as soccer, are completely unpredictable, and all they provide are partial recovery (the times are insufficient for complete metabolic recovery). This produces a progressive deficit in the PC reserve and a continuing increase in the concentration of lactate, throughout the match. A decline in the PC reserve and moderate increases in lactate buildup generate reductions in strength, reduce the maximum speed and negatively affects fine coordination. All of which lessens the efficiency and precision of specific athletic mechanics. The increase in lactate also generates pulmonary hyperventilation, a general lack of coordination, slight mental vagueness, changes in the perception of space-time relationship with partners and rivals, and impaired awareness of ball location and trajectory..
PC re-synthesis and lactate removal processes during the game are heavily dependent on the functioning and efficiency of aerobic endurance or the maximum aerobic capacity (VO2 max.). Therefore, the maximum aerobic capacity (VO2 max.) and aerobic endurance (as conditional capacities) are very important during intermittent athletic competition, such as soccer. VO2 max and the lactate production-removal rate (Lactate Turnover Rate - Rt) and the lactate oxidation rate (Lactate Oxidation Rate - R Ox) correlate very highly. Several studies also reveal a high correlation between aerobic endurance and the distance covered within the game and improved levels of recovery during a game (2, 22, 25). In addition to these evidencies, Smaros (25) demonstrated that VO2 max. is strongly correlated to the number of sprints by the soccer players, during a game. For these reasons and our own personal observations, we have come to a conclusion that from a physiological point of view, soccer (and other non-cyclical sports such as basketball, American football, rugby, hockey and tennis) that are alternate between intermittent aerobic-and “anaerobic” (no oxidative) efforts are predominantly aerobic, with non-systematic and incomplete pauses during the game. The following is evidence from different test protocols using lactate measurements obtained from more than 5.000 professional elite soccer players. These results highlight longitudinal testing periods of the Argentinean Soccer Team and other Soccer Elite’s Teams from Argentina and Mexico. 1996-1998: Atlanta 1996 Olympic Silver Medalist, the team that won the South American Championship (Play Offs) 1996-1997, and took 5th place in the World Soccer Championship in France in 1998. 7 teams from the 1st Professional Soccer Division of Mexico (2002-2006). The samples were obtained by puncturing the earlobe and obtaining blood. We used a warming cream (Finalgón) to obtain “arterialized” blood. The 25-microliter samples of blood were preserved in 50 micro liters of a solution of Buffer, Sodium Fluoride (a glycolysis inhibitor and anticoagulant) and Triton X-100 (a lysing agent of the red blood cells). The reading for each sample was a measurement of whole blood lactate (plasma lactate + the lactate in the red blood cells). These procedures are highly correlated with the intramuscular lactate and have higher correlation than venous lactate or plasma lactate values. In addition, sample preservation allows us to obtain 120 samples in under two hours of tests from 20 players, and to analyze them later with a 0.99 correlation to readings taken immediately (27). Protocols - The first principle for deciding which tests to use on a soccer team is that the protocols must measure physical qualities that are useful for coaches in training soccer players. Professional soccer (for financial reasons) has a growing competition load, and for this reason the limited time available for testing must be used to the best advantage. The second principle is that the information obtained from the testing must be immediately transferable and applicable in a simple, practical manner within the soccer players’ training program. The third consideration is that some protocols are best applied during pre-season periods while other protocols are more appropriate to control training during the competition period. However, in this article we will concentrate only on tests/protocols and results in the first 2 categories. (b) Leger Test (17) and Yo-Yo Test (2), intermittent effort tests. Many soccer trainers and coaches believe that soccer players are not natural endurance athletes. This is based on mistaken interpretation of physiology, the types of the energy required during competition and what causes fatigue during a game. They believe that soccer players should not train for aerobic endurance. These coaches believe that players should only work on intermittent efforts. For example, the most frequent protocols used to evaluate are Leger Test (17) and Yo-Yo Test (2); with these results prescribe the most frequent training loads of 10 s running with 10 s rest, 15 s running with 15s rest, 10 s running with 20 s rest at velocities of 4.5 to 6.0 m/sec. They rationalize these workouts because they say a soccer player’s game performance is similar to these efforts, and is not related to efforts of greater duration or distance (such as a series of repetitions of 300-400 m or 600-800 m). In soccer one does not run distances of 300-400 m, but the sport is also not represented by efforts of 10 s with 10 s rest or 15 s with 15s rest at the velocities indicated above. These protocols are inaccurate replications of what is really happening in soccer. Video analysis of movement during a game and further computerized analyses show that sprints of an average of 7.5 s-9.0 s take place, as do cruise runs, each averaging about 30 seconds duration (1, 3, 8, 19, 21, 22, 23, 24, 26, 28). How does this controversy affect the evaluation and training processes? Numerous physiologists and trainers only use intermittent protocols to quantify VO2 max and then also provide only intermittent methods of exercise for aerobic training (using distance’s fractions of 50-75-100 m), completely excluding longer continuous aerobic loads (distance’s fractions of 300-400-500 m.). The velocity for this test is based on a 1000 m test in which the player is asked to run at his fastest pace. The player then runs all the repetitions at 85-90 % of the average velocity of this test. We have found that this pace is the one that produces the greatest adaptations to the lactate production-removal-oxidation mechanism (Lactate Turnover – Rt, and Lactate Oxidation – ROx) (18). Lactate samples are obtained during the pauses after reps 2-4-6-8-10; and an additional post-exercise lactate reading is taken 3 minutes after the test is complete. Figure 2 shows the results of 3 longitudinal tests, developed over 6 months, on a professional soccer player. 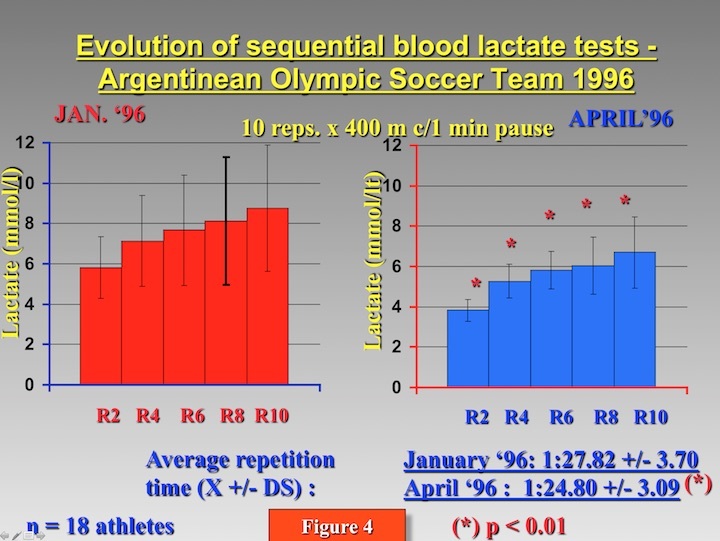 In order to exemplify the differences between a professional club player (Figure 3) with players of a national elite team, Figure 4 shows two comparative tests obtained from the Argentinean Olympic Soccer Team (1996) separated by 11 weeks of training. These players were able to run three seconds faster with a significant reduction in the lactate levels obtained after every 2nd repetition (significantly lower in all the repetitions evaluated – p < 0.01). This result shows the significant improvement in the Lactate Turnover mechanism, lowering the average lactates, with an average velocity that improved from an acceptable response (1:27.82) to a good response (1:24.80). In addition, the reduction in the standard deviation of lactate values indicates a similarity of the individual test results in the group. The average velocities are 4.5 m/s to 5 m/s, (VELOCITY III: Moderate Jogging) and this reduction in lactate levels guarantees that the players will better: a) maintain physical endurance levels, fine coordination, and explosive capacity during the 90 minutes of the game; b) that they will recover more quickly between games; and c) will lower the rate of muscular injuries due to residual fatigue. During games players must maintain aerobic endurance while performing such technical movements such as ball control, passing, defending, attacking, etc. Such specific game movements can be implemented in a testing procedure (and also into training loads.) For example, see Figure 5. This type of work is done on a circuit within the playing field of about 180-200 m. Each player uses normal soccer movements with or without a ball. It can be done by players individually or in pairs. In this example, the objective is for two soccer players to run dribbling the ball with their feet and passing it to each other, at a moderate velocity (to guarantee interval aerobic endurance), avoiding cones and obstacles, ensuring proper technique and precision, and involving the specific muscle groups used in the game. The test is done in the direction of one of the goals, then the players’ positions are reversed and the same route and movements are performed toward the opposite end of the playing field. This is done continuously, with a 1 min pause between each route of the circuit. During the final part of the test, a player can center the ball and a shot can be taken. The number of technical movements can be infinite, and it is only necessary to maintain an average velocity of 1:20” to 1:30” for each of the 8-12 repetitions. To evaluate this type of work load, a series of short intervals with short rest is used. For example, a typical set is a 10 s effort and 10 s rest (or variations such as 10 s run and 15 s rest, 15 s run and 15 s rest, or 20 s run and 20 s rest) with running speeds from 4.5 to 6.0 m/s. A typical interval would cover distances of approximately 50 m, 75 m and 100 m.
It is very important to evaluate this type of work series by means of lactate monitoring, as our experience indicates that the responses to this type of load are highly variable. The metabolic effects may be adequate, but in some cases, they can have insufficient impact or may over-stimulate, depending on the aerobic capacity and threshold of the players. 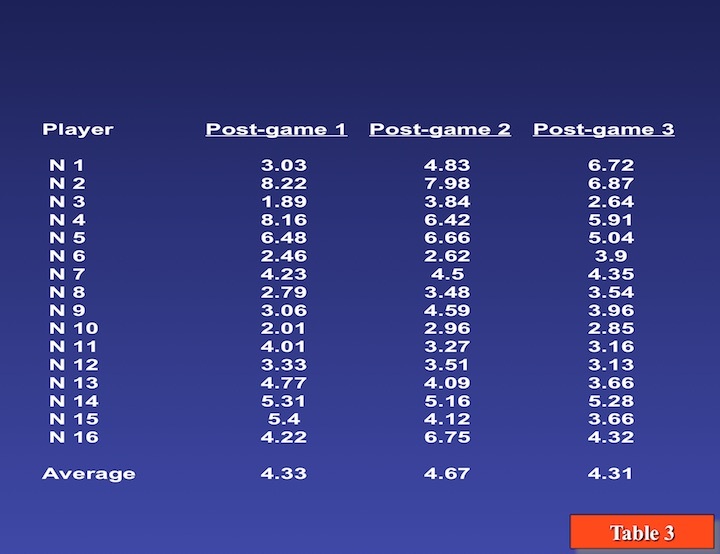 Table 2 shows an example of an evaluation performed on a team of 24 players of a first division professional team, using a combination of intense aerobic endurance intervals series with different distances and velocities, combining series of linear runs with series of back and forth runs (shuttle runs). The evaluation criteria (and the prescription of consequent training loads) are that the soccer players train on shorter distances to maintain the quality of the Lactate Turn-Over during the game without using more extensive, fatiguing work. These tests are geared to obtaining lactates that vary from 2-3 to 4-5 mmol/l. Another important aspect to highlight is that the load series must be broken up into sets of 3 min-4 min duration with rest of 1:30-2:00 between each set, for a total of 25 min-30 min intermittent work (work+rest), stressing the production and removal of lactate during the load and then additional removal and oxidation of lactate during the pauses. Similar types of evaluations were performed on teams with lower aerobic capacities with significantly higher lactate results, which is why this type of load prescription cannot be generally prescribed. This testing methods can be used to evaluate some types of physical-tactical training that are frequently used by soccer coaches and trainers, particularly to measure the energetic cost, and to try to measure duration and pauses during exercise, in order to avoid loads that will result in excessive fatigue that could potentially lead to muscular injuries due to physiological overload. This type of evaluation is usually used to test the so-called “reduced soccer”, that is to say soccer matches that take place in reduced areas with fewer players, that seek high game velocities in small spaces, with great pressure and counter-pressure so the players will become accustomed to overcoming difficulties similar to those they might expect during a real game, with precision and velocity. It should be noted that reduced soccer is an over-acting or an over-stimulus (because in real matches one would never play like this), and because of this, it is important to evaluate this work and measure the duration and pauses between stimuli. Figure 6 shows an evaluation in which 8 players per team (plus 1 goaltender per team, with a smaller goal) play on a 20 m x 40 m surface, with periods lasting 10 min, in which 4 players vs. 4 players play supported by 4 teammates per team, strategically located along the perimeter of the playing surface to receive the ball and return it to a teammate touching the ball only twice (to receive it and to pass it). This match is played in 10 min blocks, without interruption, at a high intensity, and assistants supply the ball constantly to ensure the continuity of the game. The soccer players play 10 min and then the 8 support players enter to play, and the previous players are placed along the perimeter to provide support functions. This test was done using a rotation in which players played for 3 stages of 10 min each, alternating (for a total duration of 60 min). Lactate samples were taken from each player immediately (within 30”), after each of the 3 competitive stages. 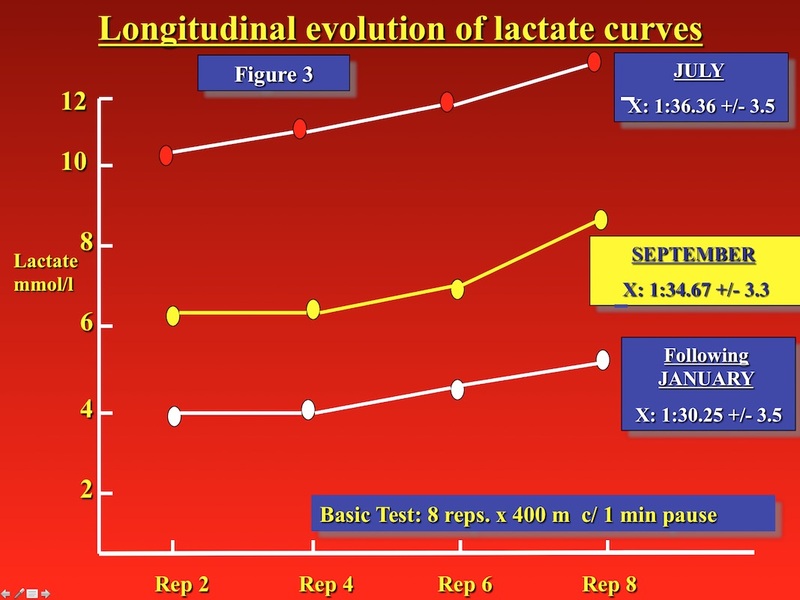 Table 3 shows the results of the lactate values obtained during this test. Table 3. Results of (X +/- sd) lactate levels (mmol/l) from the physical-tactical intermittent aerobic endurance test (reduced soccer) (n = 16 players). It is important to mention that this type of test, the design and results, can be significantly different, depending on the level of physical aptitude of the players. We’ve seen this during our evaluations of loads during reduced soccer in 2nd and 3rd Division teams, and the loads had to be reduced to 3 blocks of 7’ x 7’ and 5’ x 5’, respectively, to avoid physiological overload. A testing and training load sequence must be constructed using aerobic endurance intervals using long runs to aerobic endurance intervals that are shorter and more intense. This is based on the consideration that the enzymatic and co-enzymatic mechanisms involved in improving the Rt and R Ox, need a variety of metabolic physiological stimuli, applied in a systematic way. The maximum capacity of the Lactate Turnover Rate (Rt) and the Lactate Oxidated Rate (ROx) “are not trained as they are played”. That is to say, it is not possible to construct these metabolic qualities to develop through competitive events of 70, 80, or 90 minutes in length. It is best trained always with fractional (interval) exercises, physical-technical exercises with/without a ball and with tactical playing exercises. This is because the very broken up stimuli of a match are unable to maintain the Lactate Turnover associated with specific enzymatic stress, nor sustain the % of moderately high fractional VO2 for a sufficient amount of time. 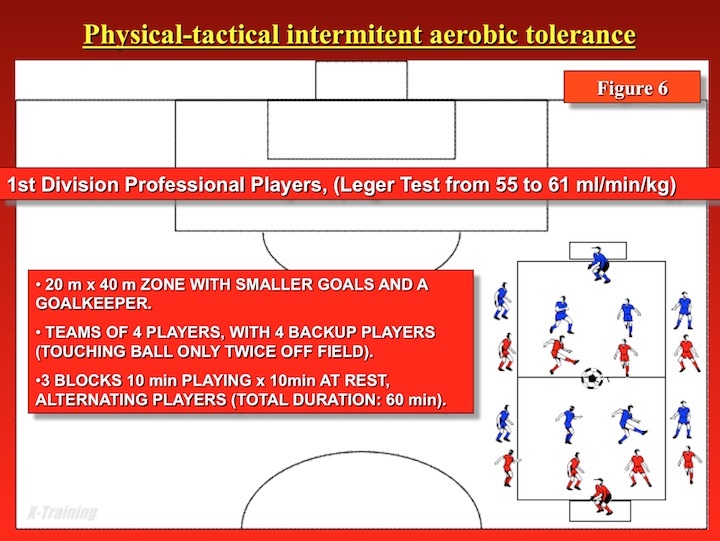 Very frequently the tests on intermittent exercises are performed on players with a high degree of aerobic capacity. These same stimuli, applied to players with moderate aerobic capacities may represent anaerobic endurance loads that have the opposite effect and may actually lower their aerobic endurance. A soccer game is not played at or near maximum VO2. Hence the development of endurance and aerobic capacity, in order to optimize the Rt and R Ox so they function as intra-game regenerators, must be done with interval repetitions of 1 min to 1 min 30 s duration, with pauses of 1 min, seeking lasting specific enzymatic “stress” (with intensities of 4 to 5,5 m/sec.). During the competition period these qualities can be maintained, with interval physical-biomechanical workouts or intermittent exercises of 10 s x 10 s, 20 s x 20 s, 20 s x 30 s and 20 s x 40 s, with intensities of 4-5 to 5.5 m/sec., specifically tested. The PC re-synthesis strength/power and the Lactate Turnover strength/power depend almost exclusively on the athlete’s aerobic capacity and aerobic power. The basis for physical and technical-tactical success in intermittent non-cyclical sports is found in these two variables, as well as high conditioning levels of velocity, strength, and muscular strength/power. One must remember that the aerobic system is also responsible for the regenerative processes that are so necessary for recovering from velocity and strength/power training loads. Systematic and exclusive use of “anaerobic” non oxidative intermittent training, without the development of the aerobic system, using aerobic endurance intervals during base training, can cause a high rate of muscular injuries and lack of motor coordination that also can generate arthro-muscular injuries. 1. Bangsbo, J. The physiology of soccer: with special reference to intense intermittent exercise. Acta Physiologica Escandinava, 150, Suppl. 619, 1994. 2. Bangsbo, J. y Lindquist, F. Comparison of various exercise tests with endurance performance during soccer in professional players. International Journal of Sports Medicine, 13, 125-132, 1992. 3. Bangsbo, J., Norregard, L. and Thorsoe, F. Activity profile of competition soccer. Canadian Journal of Sports Sciences, 16: 110-116, 1991. 4. Brooks, G. A. The lactate shuttle during exercise and recovery. Med. Sci. Sport Exerc., 18: 360-368. 1986. 5. Brooks, G. A. The “lactate shuttle” during exercise: Evidence and possible controls. In: Sports Science (Proceedings of the VIII Commonwealth, Glasgow), 1986. 6. Brooks, G. A., Fahey T. Exercise Physiology. Human Bioenergetics and its Applications. Capítulo 5 (pp. 67-95) y 10 (pp. 189-219). Mac Millan Publ. Co. New York. 1985. 7. Donovan, C. M., Brooks, G. A. Endurance training affects lactate clearance, not lactate production. Am. J. Physiol. ; 244 (7): E 83-E92. 1987. 8. Drust, B., Reilly, T. y Rienzi, E. Análisis de la prestación fìsica y de la performance en futbolistas sudamericanos de elite. En “El Futbolista Sudamericano de Elite: Morfología, análisis del juego y performance: Resultados de las investigaciones en composición corporal, análisis táctico y del movimiento, durante la Copa América 1995” (Rienzi, E. y Mazza, J.C, Eds. ), Biosystem Servicio Educativo, Rosario, Argentina, Ch. 8, pp. 89-94, 1998. 9. Essén B., Pernow B., Gollnick P. D., y Saltin B. Muscle glycogen content and lactate uptake in exercising muscle. En: Metabolic Adaptation to Prolonged Exercise. Howald H. y Poortmans J. R. (Eds. ), Basel: Birkhauser Verlag, pp. 130-134, 1975. 10. Florida-James, G. y Reilly, T. The physiological demands of Gaelic Football. British Journal of Sports Medicine, 29: 41-45, 1995. 11. Fox, E. Sports Physiology. Saunders College Publishing, Philadelphia, Ch. 2, pp. 24, 1979. 12. Gerisch, G., Rutemoller, E. y Weber, K. Sports medical measurements of performance in soccer. Science and Football, Reilly T., Lees, A., Davies, K., and Murphy, W. (Eds. ), E. & F. N. Spon, London, pp. 60-67, 1988. 13. Gollnick, P. D., Bayly, W. M., Hodson, D. R. Exercise intensity, training, diet, and lactate concentration in muscle and blood. Med. Sci. Sport Exerc., 18: 334-340. 1986. 14. Green, H. J., Hughson, R. L., Orr, G. W., Ranney D. A. Anaerobic threshold, blood lactate and muscle metabolites in progressive exercise. J. Appl. Physiol. Respirat. Environ. Exercise Physiol., 54 (4): 1028-1032. 1983. 15. Katz, J. The application of isotopes to the study of lactate metabolism. Med. Sci. Sport Exerc., 18: 352-359. 1986. 16. Kipke, L. Sport medical diagnosis by applying the lactate test. In: World FINA Medical Congress Proceedings. The London Hospital Medical College, London, 1989. 17. Leger L., Mercier, D., Gadoury, C. & Lambert, J. 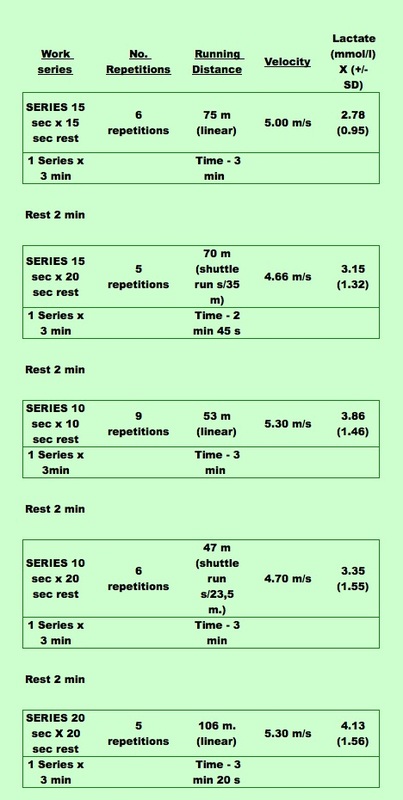 The multistage 20 meter shuttle run test for aerobic fitness. Journal of Sport Sciences, 6, 93-101, 1988. 18. Mazza, J. C. Acido Láctico y Ejercicio (Parte II). Actualización en Ciencias del Deporte. Vol. 5, Nro. 14, 1997. 19. Reilly, T. Motion analysis and physiological demands. In Science and Soccer (Reilly, T., Eds. ), E. & F. N. Spon, London, Ch. 5, pp. 65-81, 1996. 20. Reilly, T. Physiological aspects of Soccer. Biology and Sport, 11, 3-20, 1994. 21. Reilly, T. Relative distances covered in different categories of activity for outfield players, during soccer match-play. In Science and Soccer II (Reilly, T., Stibbe, A. y Clarys, J., Eds.). E. & F. N. Spon, London, 1993. 22. Reilly, T. Science and football: an introduction. In Science and Soccer II (Reilly, T., Stibbe, A. y Clarys, J., Eds.). E. & F. N. Spon, London, 1993. 23. Reilly, T. y Thomas, V. A motion analysis of work-rate in different positional roles in professional football macht-play. Journal of Human Movement Studies, 2, 87-97, 1976. 24. Rohde, H.C. y Espersen, T. Work Intensity during soccer training and match-play. Science and Football, Reilly T., Lees, A., Davies, K, and Murphy, W. (Eds. ), E. & F. N. Spon, London, pp. 68-75, 1988. 25. Smaros, G. Energy usage during a football match. Proceedings of 1st. International Congress on Sports Medicine Applied to Football. L Vecchiet (Ed. ), Vol. 11, pp. 795-801, D. Guanello, Rome, 1980. 26. Van Gool, D., Van Gerven, D. y Boutmans, J. The physiological load imposed on soccer players during real match play. Science and Football, Reilly T., Lees, A., Davies, K, and Murphy, W. (Eds. ), E. & F. N. Spon, London, pp. 51-59, 1988. 27. Van Handel, P. Methodological procedures to use YSI Blood Lactate Analyzers. Laboratory Manual, Sport Medicine Division, U.S. Olympic Center, Colorado Springs, CO, USA, 1986. 28. Whiters, R., Maricic, Z., Wasilewski, S. y Kelly, L. Match analysis of Australian professional soccer players. Journal of Human Movement Studies, 8, 159-176, 1982. Last update May 22, 2018 All contents © Sports Resource Group, Inc.